There’s some gadgets you see and think "that’s nice", but you know deep down if you bought one, you’d never ever use it. 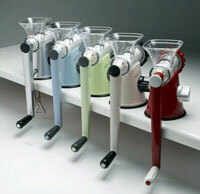 Enter the Easy Health MultiMincer and Pasta Maker. So why are we taling about it? Well, it looks great and would sit in your retro kitchen a treat. And of course, there may be someone out there who would have a practical use for it! So what does it do? Well, it apparently has the ability to professionally mince all types of meat, vegetables, nuts and beans (have you ever had minced beans? ), but is equally adept at making pasta (three different pasta shapes). It’s also supplied with a stainless steel mincing blade, course plate and fine plate, not to mention a sausage making attachment, whuich is sire to provide hours of "Generation Game" type fun.